Home » Why Consider Temporary Employment? Are you in between jobs? Are you looking to gain more experience? Have you applied for your dream job but were turned down because of lack of experience? Are you not currently working? Considering temporary employment is a great way to get back to work quickly while learning new office skills, gaining experience, and generating an income at the same time. Often times as I meet with candidates they are initially very hesitant to take on a temporary job until I explain the benefits. Read below to find out the three reasons I encourage people to consider temporary employment opportunities. Clients contact us for temporary office help usually because it is their busy season or they have someone on vacation or medical/maternity leave. I often see temporary positions act as a stepping stone for candidates to land their permanent job. As part of our process we send out evaluations to our clients asking for feedback about your performance while on assignment. Great job performance can lead to great testimonials that we use while recommending you for other opportunities. It can help set you apart from other candidates and I have seen these recommendations be used as deciding factors on who is hired. As you are proving you can adapt to evolving business demands, you are also developing invaluable skills and training. According to the American Staffing Association, one third of temporary workers were offered a permanent job where they worked on an assignment. Maybe the assignment entailed covering for someone on medical or maternity leave and they decided not to return, or maybe you did an exceptional job and earned yourself a spot in the office. Either way, the entire duration of your assignment was an exercise to sharpen your job skills. We have seen all of these factors play out and that temporary job you were hesitant in taking has now turned into a permanent opportunity! You never know who you will meet on a temporary assignment who can help in your future career, whether co-workers, supervisors, decision makers, or clients. By having a seat at the table, you are able to connect with people in your community. In recruiting we constantly talk about networking and accepting a temporary assignment is another way of getting yourself out there. You never know what connection might help you land your next job. The next time you are presented with an employment opportunity with the word “temporary” in front of it, take a closer look at the big picture of how that might help you in your career path. As a Recruiter my goal is to help you achieve your goals, and there are times that temporary employment can be a huge piece in achieving those long term goals of permanent employment. Want to talk to Celebrity Staff about open administrative, legal, or management opportunities in the areas we serve? Call us at 800-910-7354 or submit a general inquiry by filling out our Quick Apply form. 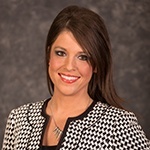 Jill grew up in Wahoo, NE and attended college at Midland University where she graduated in May 2013 with a bachelor’s degree in sports management and business administration. In September of 2013, Jill joined Celebrity Staff’s Lincoln team where she is currently a recruiter. She enjoys interviewing and building relationships with each candidate to assist them in their career path. In her free time, Jill enjoys spending time with her husband, Ethan, traveling with her family, and attending sporting events. Hey Jill, this was surely an interesting read as I didn’t read about temporary employment in detail prior to this. Do you think, this can be a suitable option for those who are looking forward to work in Thailand?